In some cases, the courts have thwarted the administration’s attempts at unilaterally limiting who can enter the United States. Contrarily, Trump, without evidence, continues to tout progress on “The Wall” along the nation’s southern border and, most recently, deployed US military forces to stop what he sees as an “invasion” of migrants from the south. The uncertainty leads to big, philosophical questions on governance such as: How far does presidential power go when it comes to immigration policy? In New Mexico, the charged debate over immigration has raised a narrower question for the state’s legal community. Should people in the United States illegally—regardless of whether they are eligible to hold jobs—be allowed to practice law here as long as they’ve passed the state bar exam? The state Supreme Court is considering the question as a proposed rule change; it’s not clear when the justices will decide. If they adopt the change, New Mexico would join just a handful of states, including New York and California, to explicitly allow undocumented immigrants to practice law after passing a bar exam. A small group of lawyers, led by Albuquerque-based Maureen Sanders, proposed the change. Sanders declined to comment for this story, but Ed Chavez, who retired in March after 15 years as a state Supreme Court justice, was involved with the court’s admissions committee when the proposal came forward. He says the idea was born out of concern over Trump’s more draconian and fiery immigration rhetoric and policies. Current New Mexico Supreme Court rules allow US citizens and some people not born in the country—including legal permanent residents and people “otherwise authorized to work lawfully in the United States”—to practice law in New Mexico. Two women, one of them a Dreamer, have spoken to New Mexico reporters to tell their stories of graduating law school as undocumented immigrants. At least one of them is working here as a defense lawyer, though it appears her status changed just before she was admitted to the bar. Based on the public comments submitted to the court, Chavez is right. Published on the Supreme Court’s website, the proposed rule change brought more than 120 written comments from lawyers, advocacy groups, law students and others around the state during a comment period that closed in April. That dwarfs the number of comments on other proposed rule changes. And those who wrote in had strong feelings. Albuquerque attorney John Farrow opposes the change, writing that he is “sympathetic to those who are in this state illegally by no fault of their own,” but those people should become citizens before they’re allowed to practice law. “I do not see how anyone who has failed to become a citizen or legal resident of this country can truthfully or honestly take the attorney’s oath” as required by a different Supreme Court rule, Farrow writes. Stuart Bluestone, a retired Santa Fe lawyer who worked 34 years as a prosecutor and in other areas of law, writes in support of the change, reminding the justices that the principle of federalism allows them to expand rights for people in New Mexico beyond federal interpretations. 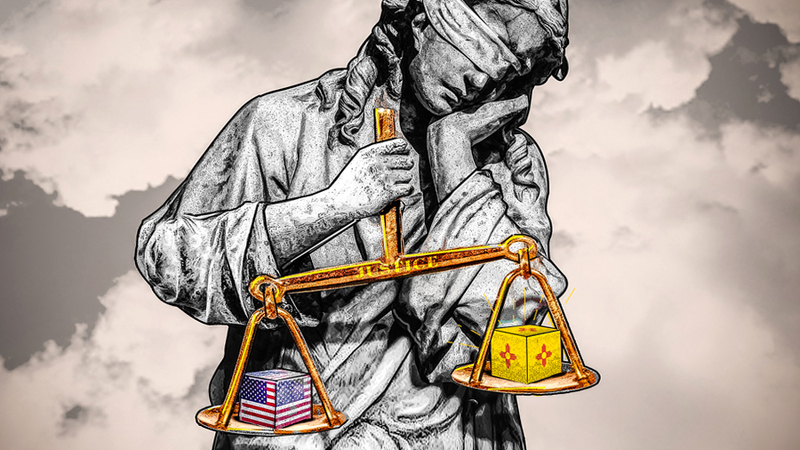 Bluestone added that the proposed change could result in a more diverse perspective among attorneys and help remedy a “grave injustice” taking place in New Mexico’s federal courts: That some immigrants, including children, do not have adequate access to lawyers in deportation cases. “To the extent this new rule can help provide committed lawyers who can correct this injustice by serving as needed lawyers for children and others in immigration cases, the rule represents sound judgment and should be adopted,” he writes. This story was published in collaboration with the Santa Fe Reporter, a NMID partner.